As a young man Pammachius attended schools of rhetoric. He married Paulina in 385 and was a friend and defender of Jerome. 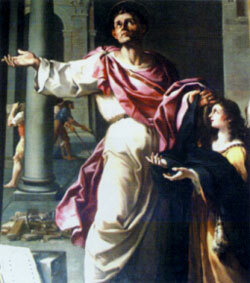 On Paulina's death in 397, Pammachius became a monk, wore a habit and gave himself to works of charity. He held church in his home and built a hospice at Porto for poor strangers. The site has since been excavated, revealing a plan with rooms and halls for the sick and poor.